Atlantique Manutention performed loading operations on March 19th on M/V Palembang for Haliade 150 offshore wind turbine nacelle produced by the new General Electric (former Alstom) factory at Montoir de Bretagne. Ordered by EDFEN, thenacelle will be installed at the Osterild test site. The entire project (including other components of the turbine) was directed by OCTRA, a French engineering and transport board, recently based in Montoir and headquartered in Paris. This was the first lo-lo handling operation to be conducted for this type of nacelle. The previous nacelles were loaded by ro-ro operation at the Saint Nazaire dock basins. 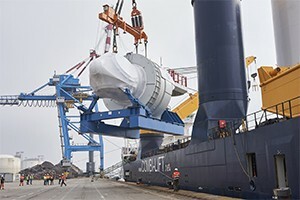 The 422-tonne nacelle was conveyed by specialist haulage firm Transports Scales on 18th March from the factory to the TGO terminal, where it was stored pending loading.